While this week’s fashion trend may not have originated on the catwalk, it holds a special place in most of our childhoods. From grade school to high school, college and beyond, friendship bracelets have been around in one form or another. With summer in full force, now’s the perfect time to revisit, or discover for the first time, this fun and eye-catching must-have accessory. More than just intertwined pieces of colorful thread, friendship bracelets are now embellished with all kinds of quirky doodads. Chains, jewels, faux diamonds, studs…you name it, it’s probably been done! 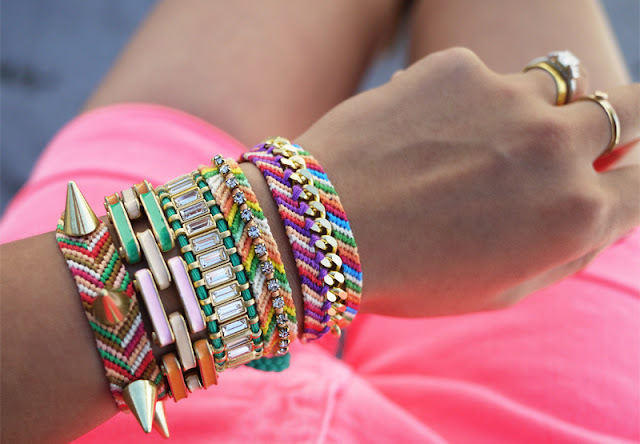 Wear just one, a wrist full or go crazy and mix and match them with a hodgepodge of bracelets and bangles. Regardless of how you decide to wear them, they’ll serve as major arm candy! Blog Inspiration: From eclectic to classic and preppy, fashion bloggers everywhere are incorporating friendship bracelets into their daily style! If your style is zany and eccentric, then this outfit by Kryz Uy (Thirstythought) should feel right at home! Mixing prints and playing with colors and textures is the key to making friendship bracelets your own. Kryz’s Hawaiian-inspired floral top and dark khaki cuffed pants look effortlessly chic when paired with a handful of unique handmade bracelets. No fashion report on friendship bracelets would be complete without mention of Blair Eadie (Atlantic-Pacific), the queen of arm parties. Known for her impeccably styled ensembles, Blair makes her colorful tribal print friendship bracelet look like a million bucks! I absolutely love how she mixes high and low (a Michael Kors watch, anyone? 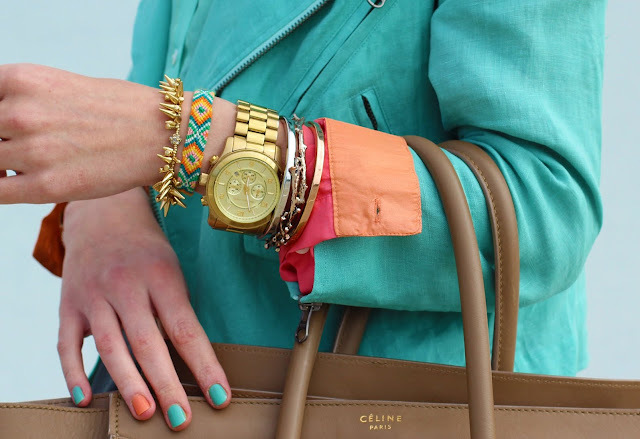 ), combines a variety of bracelet types and color coordinates her look (I spy teal and tangerine everywhere!). Sarah Vickers of Classy Girls Wear Pearls proves that friendship bracelets are versatile and super chic when paired with the right outfit and accessories. Friendship bracelets aren’t limited to bright and off-the-wall colors. You also can find ones in more neutral hues, even adorned with classy pearls. 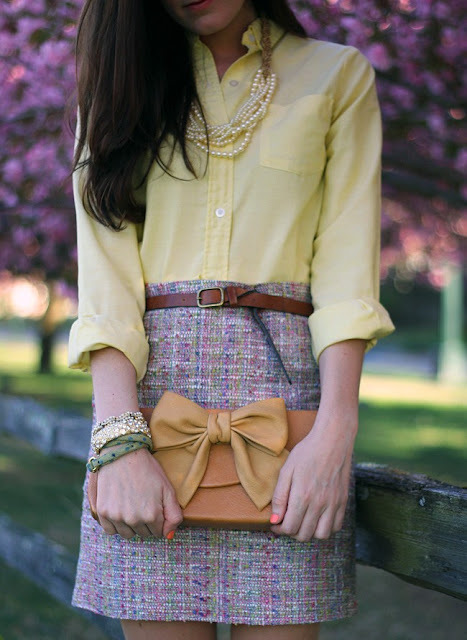 A yellow oxford shirt, confetti-colored tweed skirt, bow clutch and pearls make her friendship bracelet all grown up! The best part about this trend is that you can do it yourself! Invite your besties over and have a friendship bracelet-making party! 1. Honestly…WTF: If you’re yearning to make a classic chevron patterned friendship bracelet, then this page has you covered! With some embroidery thread (in your favorite colors! 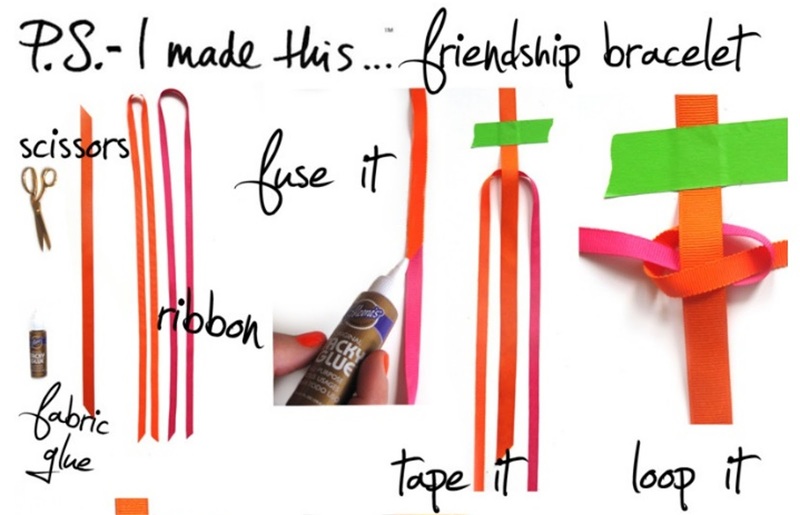 ), a safety pin or tape, scissors and a bit of practice, you’ll be well on your way! Bonus points if you can figure out how to embellish it with a rhinestone chain! 2. P.S. I Made This: What does Erica Domesek (the mastermind behind P.S. I Made This) not know how to make?! From “Designer DIY” projects such as an eyelet collar (as seen in Louis Vuitton’s spring 2012 show) to a simple sequin pocket skirt, she makes it easy to recreate high-end looks. 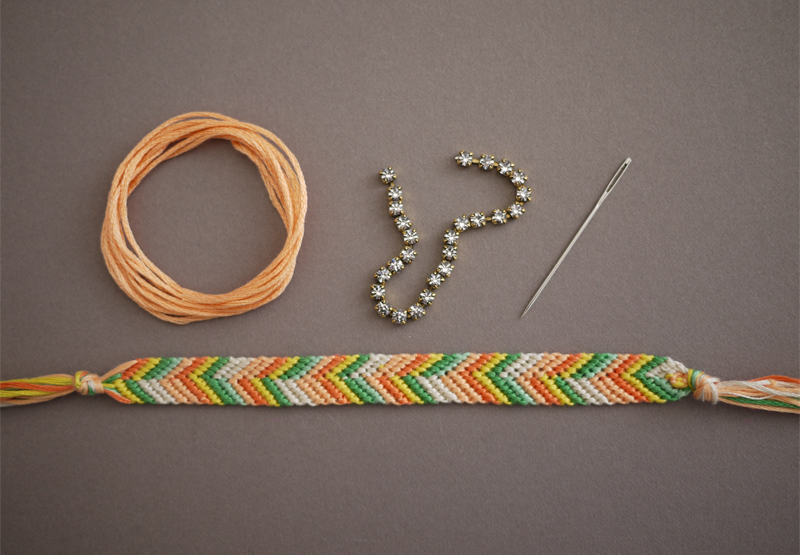 With easy-to-follow, step-by-step instructions, you’ll have no trouble making this friendship bracelet! 3. 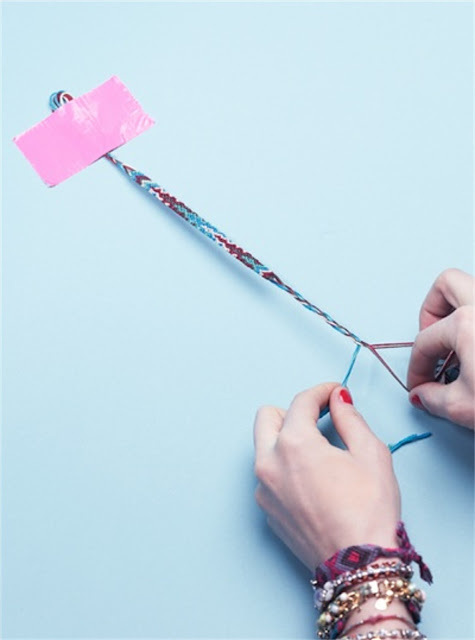 Teen Vogue: Always up-to-date with the latest trends for budding fashionistas, Teen Vogue shows you how to make a whole collection of friendship bracelets for yourself and your friends. It definitely takes some time, but it’s worth it to customize your own design by adding a cute charm or vintage beads. Available in a variety of pretty color combinations (this one’s in portico green), these braided friendship bracelets from Madewell are budget-friendly and perfect for stacking. Wear it with a white T-shirt or go Bohemian by pairing it with a white lace dress. 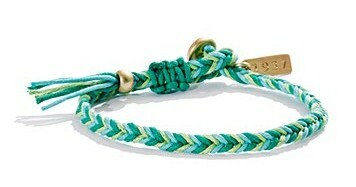 Complete it with a signature 1937 metal charm…this friendship bracelet is too cute to pass up! Friendship bracelets come in nearly every color, pattern and size, so you don’t have to pick just one! While it’s oodles of fun to stack friendship bracelets, sometimes one will do the trick. 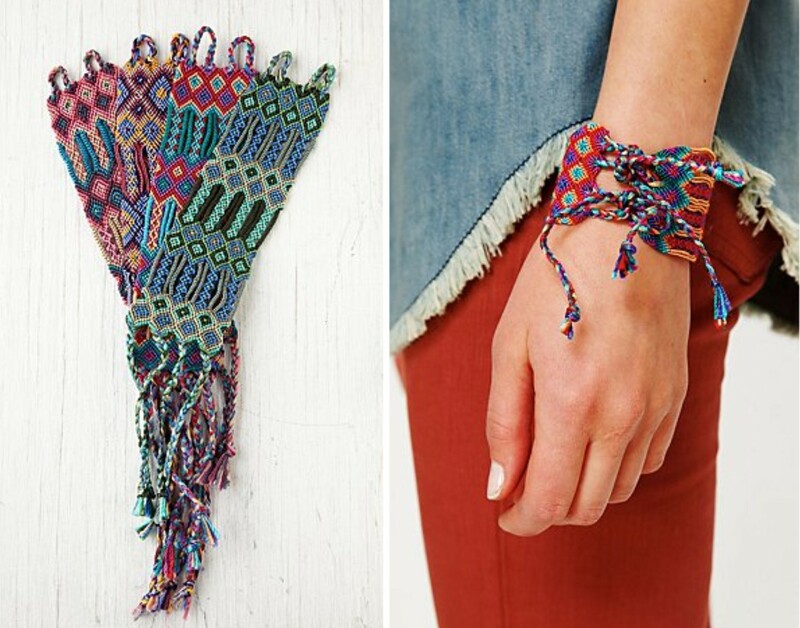 What is there not to love about Free People’s collection of oversized friendship bracelets? They’re the perfect complement to your chambray oxford, but will look equally stunning with one of Free People’s classic floral dresses. Here’s the cool part: When you order one of these bracelets, you’ll be in for a surprise! Due to the variety of assorted colors and pattern schemes that are available (each one is slightly different, but definitely similar to the ones shown above), you won’t know which one you’ll get until it arrives! If you’re looking for a bracelet that goes above and beyond friendship, look no further. This rainbow colored bracelet represents peace, love, happiness and friendship. For a happy-go-lucky feel, wear it with a sky blue cutout dress or opt for a simple blouse and colored shorts. An oldie, but a goodie, friendship bracelets are now completely acceptable for young women in their twenties. 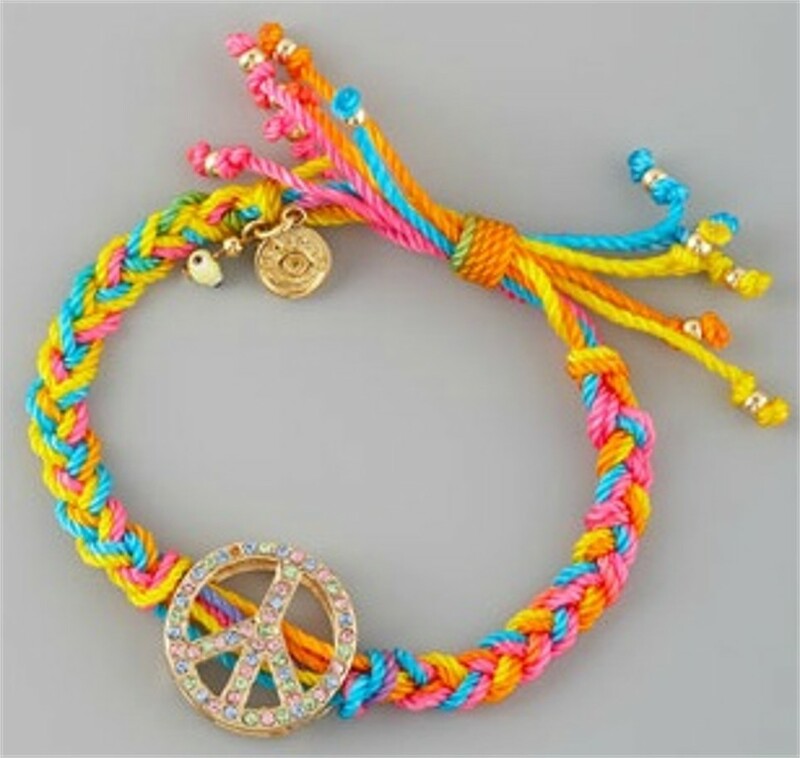 Whether you loved friendship bracelets as a child or are just catching onto this summer 2012 trend, you can never be too old to incorporate one into your look! Cool! I made a friendship bracelet how-to video at my blog: http://lac998.blogspot.com/ .